We packed them for one of our trips and I had two of them an evening before instead of workout… But let’s assume it’s still better than eating a cake like this. Preheat the oven to 180°C/160°C fan and very lightly butter a 6-hole muffin tin. Place the mashed bananas, peanut butter, muscovado sugar and vanilla extract in a bowl and mix until well combined. Add the salt, baking soda, baking powder, wholemeal flour, jumbo oats and dates. Stir to combine. Spoon the mixture into the muffin tin. Bake for 20-25 minutes and pale golden on top. Posted in Autumn, Muffins and pastries, Spring, Summer, Winter and tagged bananas, oats, peanut butter. Bookmark the permalink. I think muffins are on the cusp of healthy/naughty which is all right by me – especially when they look so tasty. 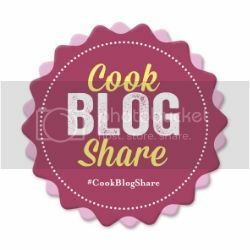 Thanks for linking to #CookBlogShare – alway lovely to see your beautiful recipes.